The University of Illinois Springfield has partnered with the Universidade Estadual de Maringá (UEM) to research the aquatic ecology of the Paraná River in Brazil and the Illinois River in the United States in order to better understand the effectiveness of conservation and restoration efforts. 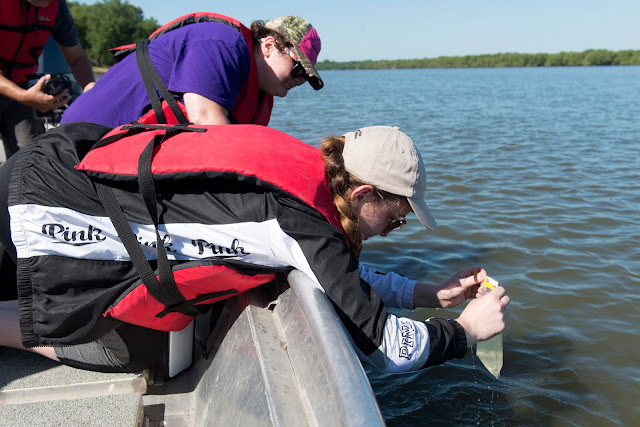 A group of five UIS students and one faculty member spent three weeks in Brazil in June as part of a study abroad trip where they conducted field water sampling, traveled to university field stations and took boat tours of the floodplain. In July, a group of four Brazilian students and one faculty member came to the United States for three weeks to study the Illinois River floodplain. A large amount of the Illinois research was conducted at the UIS Therkildsen Field Station at Emiquon near Lewistown. In particular, researchers compared the water chemistry and zooplankton composition of the last protected stretch of the Paraná floodplain (230 km) to those of the restored areas of the Illinois River floodplain. “Overall, we found that the nutrient concentrations (total nitrogen, total phosphorus, etc.) were much lower in the surface waters of the Paraná floodplain than those of the Illinois River. These differences are due to many factors, including the influence of hydroelectric dams upstream from the sampling sites in Brazil and the widespread use of fertilizers in the Illinois watershed,” said Keenan Dungey, UIS associate professor of chemistry and associate vice chancellor for research and institutional effectiveness. There were 184 total zooplankton species identified among all the sites, some of whom were similar on both continents. The zooplankton community compositions were different, with those of Paraná having a greater species richness and those of Illinois having a greater abundance. Biogeography, climate, and availability of nutrients were different factors the students considered when comparing the zooplankton communities. Results from the collaboration will be presented on each campus and at an international science conference. The information gathered will also become part of a new course, “BIO 334 ECCE: Conservation and Restoration of Large River Systems in North and South America”. This online, international, bilingual course will be co-taught by UIS Biology Professor Michael Lemke and UEM Professor Felipe Velho, vice director of the Center for Limnology this coming spring semester. During the course, students from both countries will learn the science behind restoration and conservation and the cultural differences and similarities between Brazil and the U.S. that result in different approaches to the environment. The Paraná River and Illinois River systems will serve as case studies and students from both countries will work together on group projects. “My objective in designing this course was to explore the cultural interpretation of conservation and the same for restoration ecology in a world where the terms become harder to interpret and there is more on the line (not only loss of resources, but re-definition of what resource is, and the influx of huge business interests) both for the loss of and the conservation of natural resources,” said Lemke. While in Brazil, UIS students also had the chance to view Iguassu Falls, one of the seven natural wonders of the world, and got a technical tour of the Itaipu Dam, the largest hydroelectric dam in the world (in terms of consistent power output). “Besides the amazing sites, the great science, and meeting wonderful people, the most significant aspect of the trip for me was to be able to see students from two continents that spoke different languages develop friendships with one another,” said Dungey. This summer’s project grew out of a ten year research collaboration between Professor Lemke and UEM scientists. The program was partially funded by a $25,000 Innovation Fund grant from the Coca-Cola Foundation-sponsored competition, “100,000 Strong in the Americas”, which was administered by Partners for the Americas. The goal of this fund is to increase college student exchange between North and South America, for the purpose of furthering international understanding and student career development. UIS was one of only eight United States institutions to receive the award.